As the days become cooler, we head indoors, pull on an extra sweater, add a log to the fire and fill our home with the scents of warm apple cider and pumpkin bread fresh from the oven. The spicy aromas of cinnamon and nutmeg are seemingly synonymous with this change in the seasons. Outside we associate fall primarily with the changing colors of the leaves, the ripening of berries and the harvesting of pumpkins and gourds, but we are also intrinsically aware that there is a change in the air. The fragrances of fall include caramel, vanilla, cloves and honey. Doesn’t that sound like a delicious recipe worth stepping outside for? 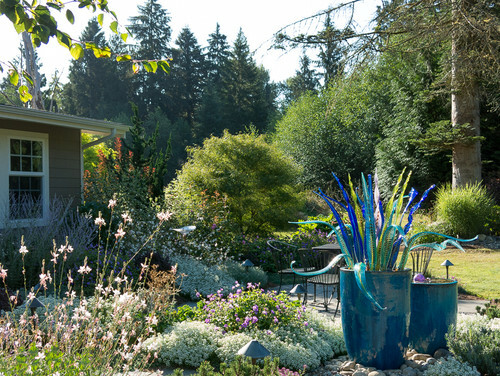 This selection of trees, vines, shrubs, perennials and even hardy annuals will entice you out into the garden, as the intoxicating scents of flowers and leaves waft remarkable distances across the autumn air. For some of these plants, fall is their peak season; for others this is simply the continuation of spring and summer interest. How many do you have room for? Who can resist the smell of caramel corn or cotton candy? The scent of the katsura tree has been described as both of these. 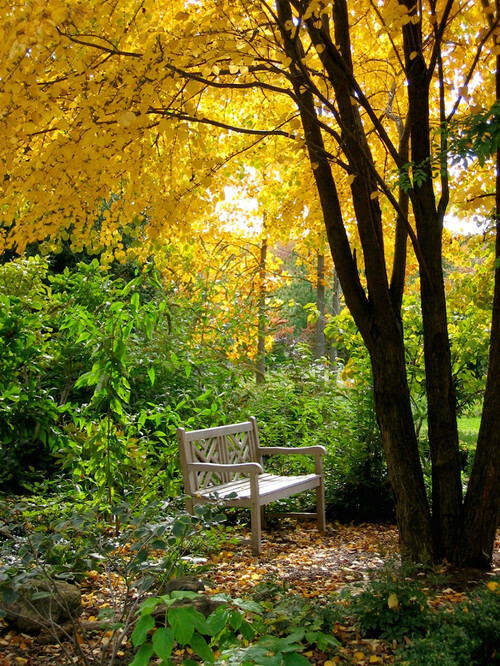 As the foliage turns yellow, the fragrance is released and can be enjoyed from a considerable distance. I was introduced to this remarkable tree when I moved to the Pacific Northwest and was working at a nursery. The scent was tormenting me as I hunted everywhere for the kettle corn stand that I was convinced must be nearby. My colleagues eventually stopped laughing and pointed out a cluster of these magnificent trees at the far end of the parking lot. Not surprisingly, I now have one in my own garden. To me it is the harbinger of fall. There are many daphne to choose from, perhaps the most popular being those that bloom in late winter and early spring. Eternal Fragrance begins flowering in midsummer, but as you can see from this fall container, it continues to bloom many months later. The smallest sprig of these pale pink trumpet flowers can perfume an entire room; a small bush can easily fill a courtyard or patio with its intoxicating scent. The fragrance is like no other. Perhaps jasmine with spicy overtones? Maybe a hint of orange blossom? You’ll just have to grow daphne and decide for yourself. 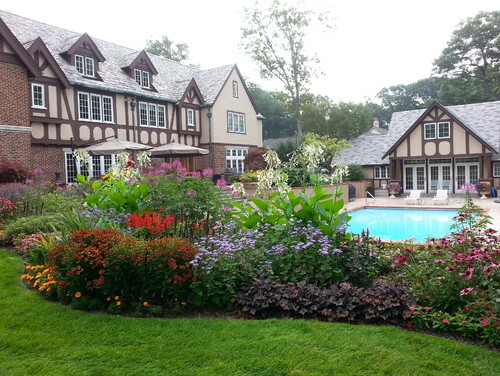 Photo by Hawks Landscape Inc. Whether you consider sweet autumn clematis a vicious thug or a vigorous vine, you can’t help but love the fragrance it brings to the late-season garden. The starry white flowers have a smell reminiscent of honey. Note: This plant may be considered invasive in your area. Check with your local extension office before planting. 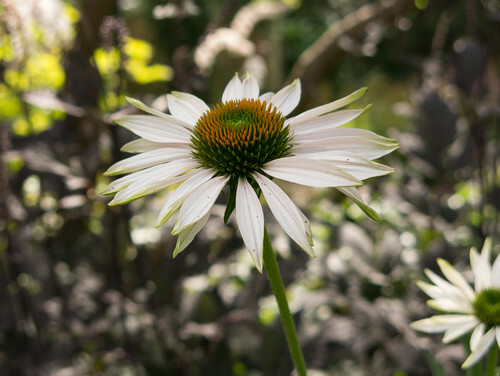 With coneflowers in shades of red, orange and yellow, as well as the better known pink and white, how do you choose? My solution is to include several, but I like to make sure at least one of them is fragrant, and I think Fragrant Angel is one of the best. I have heard its perfume described as that of baby powder and heliotrope — to me it leans more toward vanilla. Origin: While the species is native to the U.S., this is a garden hybrid. 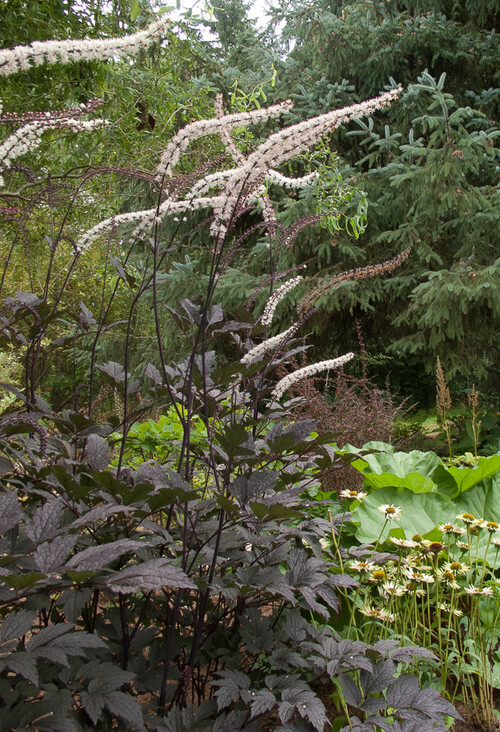 With such an unfortunate name, it’s hard to imagine that snakeroot, also called black cohosh, could be either beautiful or fragrant — but in fact it’s both. There are several garden varieties of snakeroot that have almost black leaves, and one of my favorites is Hillside Black Beauty. Rich blue-black leaves form a large clump, which is stunning enough, especially when set off against golden foliage such as that of Golden Spirit smokebush. In late summer tall spires push skyward, each one tipped with long, white foxtail-like blooms that release a vanilla scent until fall. Origin: The species is native to Russia, China, Korea and Japan, but this is a garden hybrid. 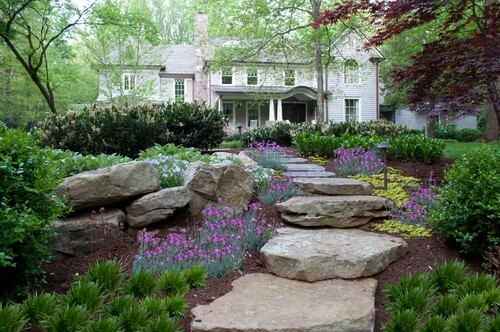 Lining this simple stone pathway is this unassuming evergreen perennial that packs a serious perfume punch. Cheddar pink is known primarily for its spring flowers, but I have found that many varieties reliably bloom repeatedly in autumn; Firewitch, shown here, is perhaps the most floriferous. Low, mounding cushions of finely textured gray leaves are studded with the hot-pink flowers that release a spicy, clove-like fragrance into the fall air. 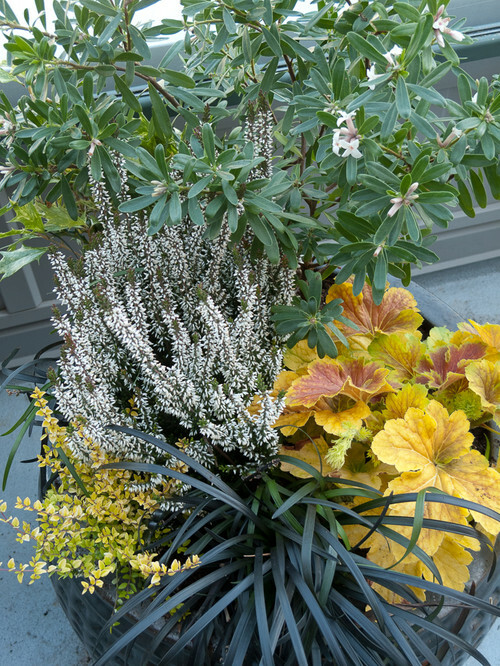 I use this both in the landscape and containers, where it looks especially pretty with silver and white foliage. Origin: Firewitch is a garden hybrid. It may seem rather strange to be including annuals in an ideabook for fall, but both of these withstand cooler temperatures and add masses of flower power, as well as heady perfume at the end of their season. This underused annual, also called woodland tobacco plant, quickly fills a big space — useful for those of us with gaps to fill or larger gardens — as can be seen in the photograph above. 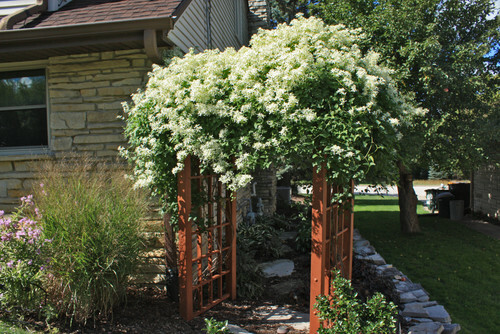 The wide basal rosette of green foliage quickly covers the ground, but it is the 6- to 8-foot-tall spires of dangling, white tubular flowers that are the real reason for growing this. The light jasmine fragrance is released late in the day, so your evening stroll is the perfect chance to appreciate this. Water requirement: Average; mine have not needed watering at all when planted in full sun and somewhat moisture-retentive soil, suggesting they may have a degree of drought tolerance. I never thought this would be an annual I would use in my own garden. I considered sweet alyssum rather old fashioned — the flower of Victorian-style bed designs, typically combined with red geraniums and blue lobelias. My perspective changed when I needed a quick, inexpensive filler this summer. Since this little ground cover is usually available in bedding packs, it fit the bill. I used it to loosely edge a long border, weaving drifts around larger shrubs and roses along the way. The result was a glorious, romantic froth of pure white flowers that scented the garden with the smell of honey from spring until fall. Although considered an annual, in many areas it will self-seed and reappear the following year — or even be an herbaceous perennial.